Samsung seems to be in hot water again, this time over negative comments which appeared on HTC One reviews by people apparently paid to write them by the Korean firm. Only last week did police raid Samsung's Seoul offices after LG accused the firm of stealing its OLED secrets and now the Galaxy S4 maker is being investigated by Taiwanese authorities over false advertising. According to AFP, Samsung hired students in Taiwan to post negative comments about the HTC One online, while also promoting its own products in the process. Apparently if these allegations are upheld Samsung could face a fine of around $835,000 (£545,680/AU$805,200), and there will be some red faces around its office too. 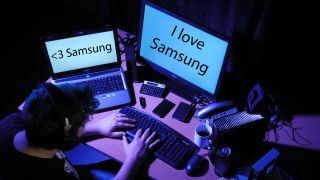 There may be some truth in the allegations though, after Samsung Taiwan posted a message on its Facebook page saying: "Samsung Taiwan has ceased all marketing activities that involve the posting of anonymous comments. "We regret any inconvenience this incident may have caused. We will continue to reinforce education and training for our employees to prevent any future recurrence." We have spoken to HTC and Samsung about these allegations and will update this article if we receive a comment from either party.